About 10 species, mostly natives of southern Europe. Besides the following, 3 others occur in the United States. Type species: Phalaris arundinacea L.
Outer scales not winged; inflorescence a narrow panicle. Outer scales broadly winged; inflorescence a spike or spike-like panicle. 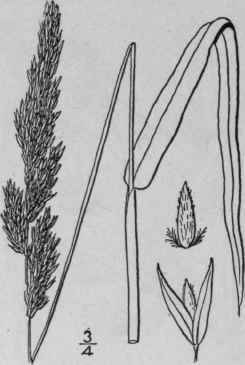 Spikelets narrow; third and fourth scales much reduced, rigid, subulate, hairy. Phalaris arundinacea L. Sp. PI. 55. 1753. Glabrous, culms erect, 2°-5° tall, simple, smooth. Sheaths shorter than the internodes; ligule 1"-3" long, obtuse, membranous; blades 3 1/2'-10' long, 3"-8" wide, acuminate, smooth or scabrous; panicle 3'-8' long, dense, its branches 1/2'-1 1/2' long, erect or sometimes slightly spreading; spikelets 2 1/2"-3" long; outer scales scabrous, 3-nerved; third and fourth scales less than one-half as long as the fifth, subulate, rigid, hairy; fifth scale about three-fourths as long as the spikelet, chartaceous, pubescent with long appressed silky hairs, subtending a palet of similar texture and a perfect flower. In moist or wet soil, Nova Scotia to British Columbia, south to New Jersey and Colorado. Also in Europe and Asia. Lady-grass, Spires, Doggers, Sword-grass, Ladies' or Bride's-laces, London-lace. July-Aug. The Ribbon-grass or Painted-grass of cultivation, the so-called variety picta, has leaves variegated with green and white stripes, is a derivative of this species, and sometimes escapes from gardens. Phalaris caroliniana Walt. Fl. Car. 74. 1788. Phalaris intermedia Bosc. ; Poir. in Lam. Encycl. Supply 1: 300. 1810. 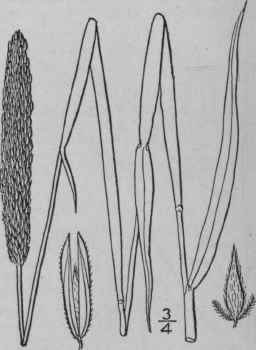 Phalaris americana Ell. Bot. S. C. & Ga. 1: 101. 1817. Culms 1°-3 1/2° tall, erect or sometimes decumbent at base, simple or somewhat branched, smooth or roughish, glabrous. 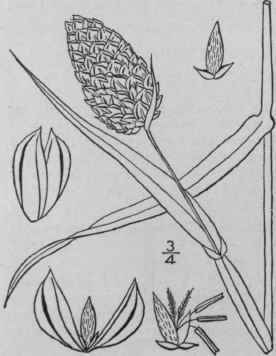 Sheaths usually shorter than the internodes; ligule 1"-3" long, rounded, thin-membranous; blades 2'-6' long, 2"-5" wide, smooth or slightly scabrous; spike-like panicle 1'-4' long, dense, its branches about ¥ long, erect; spikelets 2 1/2" long, the outer scales more or less scabrous, 3-nerved, wing-keeled; third and fourth scales less than one-half as long as the fifth, subulate, hairy; fifth scale about two-thirds as long as the spikelet, acuminate, pubescent with long appressed silky hairs. In moist soil. South Carolina to Missouri and California, south to Florida. Texas and Arizona. Southern or Wild Canary-grass. Ribbon-grass, California Timothy, Southern Reed-grass. Fox-tail-grass. June-Aug.
Phalaris canariensis L. Sp. PI. 54. 1753. More or less roughened, culms 1°-3° tall, erect, simple or branched, glabrous. Sheaths shorter than the internodes; ligule about 1" long, rounded; blades 2'-12' long, 2"-6" wide, strongly scabrous; spikes 1/2'-1 1/2' long, ovoid or oblong; spikelets 3"-4" long; outer scales glabrous or sparingly pubescent; third and fourth scales about half the length of the fifth, broadly lanceolate, thin-membranous, sparingly hairy; fifth scale about two-thirds as long as the spikelet, acute, pubescent with appressed silky hairs. In waste places. Nova Scotia to Ontario. Virginia, Missouri and Colorado. Naturalized from Europe. The grain is the common food of canary birds. July-Aug.